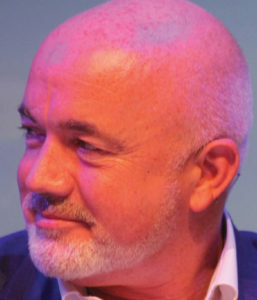 Ryanair March passenger numbers are up 9pc to 10.9m, Ryanair grew 5pc to 10.5m plus 400k for Lauda. 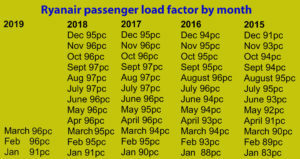 Load factor is an industry-leading 96pc, the first time Ryanair achieved that figure in March, compared with 95pc in 2018, 94pc in 2017 and 2016 and 90pc in 2015. Lauda load factor at 94pc. Rolling annual is up 9pc to 142.1m. Ryanair operated 59,800 scheduled flights in March. The Ryanair summer schedule from Dublin Airport totals 82 routes, delivering up 6pc to 14.1m passengers and 14 new routes: Bordeaux (2w), Bournemouth (4w), Bodrum (2w), Cagliari (2w), Dubrovnik (4w) Gothenburg (2w), Kyiv (2w), London Southend (twice daily), Lourdes (2w), Milan Malpensa (daily), Thessaloniki (2w), Luxembourg (3w), Frankfurt (12w) and Split (4w).